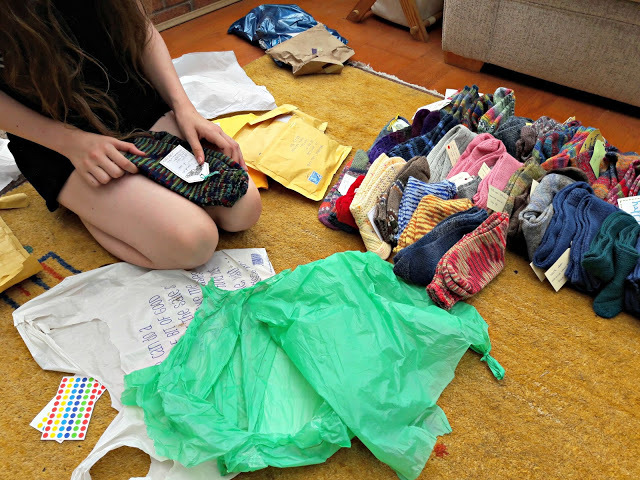 Here's a photo one of my minions helping me to unpack the first of the socks. 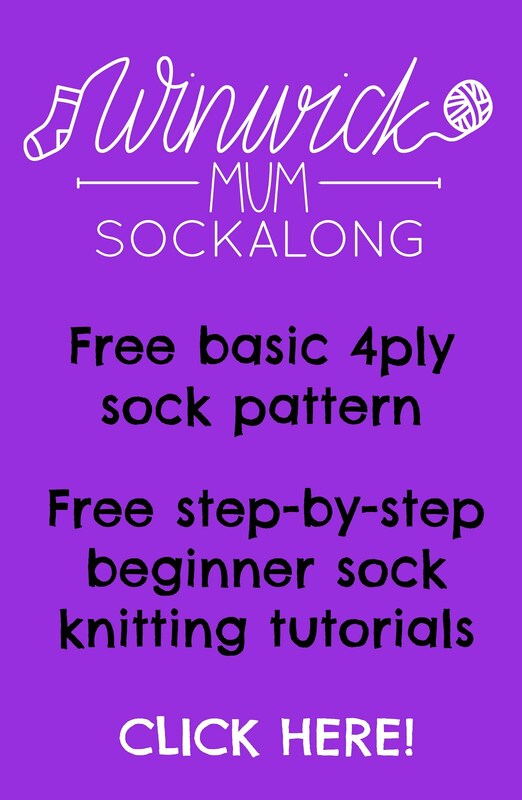 Small daughter had a surprisingly long attention span for this and we rattled through the packets, logging and photographing each pair of socks, in good time. 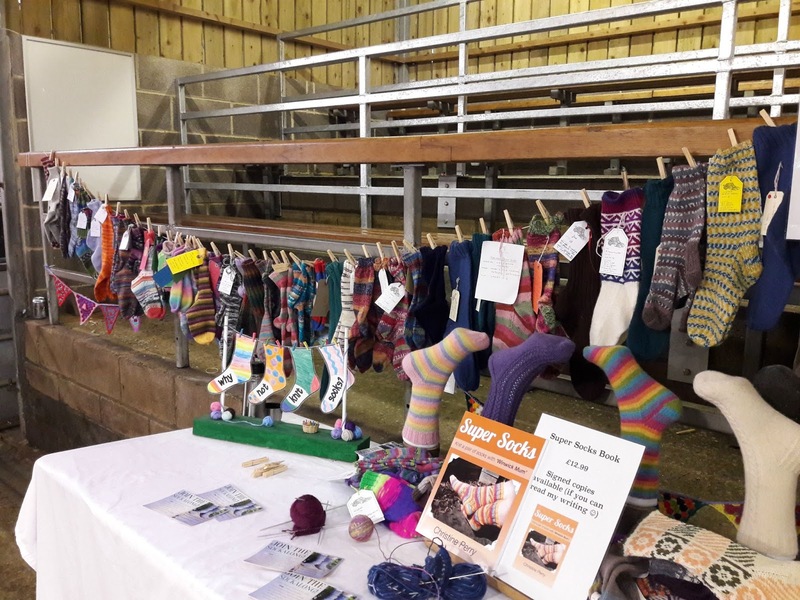 I like to make sure that I have a note of every pair of socks: where they come from, the colour, the size and who made them as it helps me to identify the socks and where they are going to go after Yarndale. 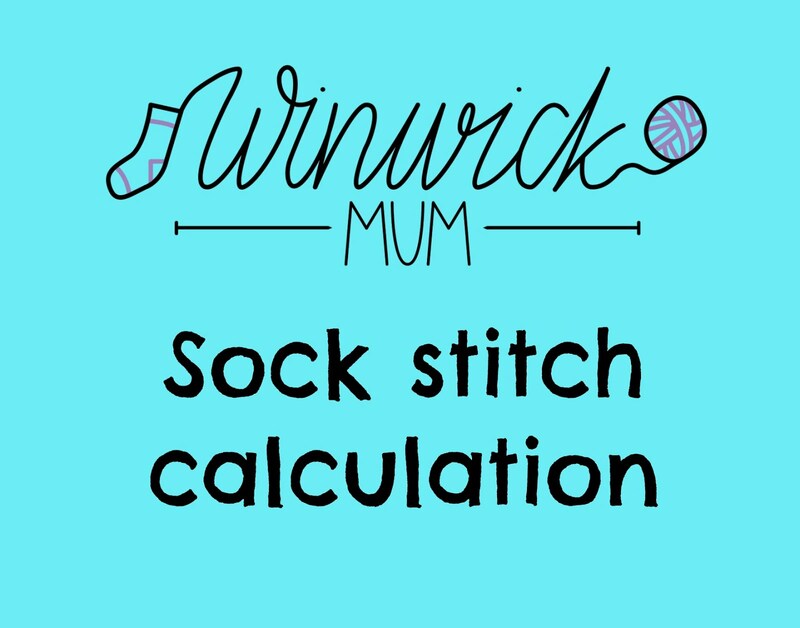 I think that last piece of information about who made the socks is especially important as I like to be able to tell you where the socks have gone later. It completes the circle nicely, I think. 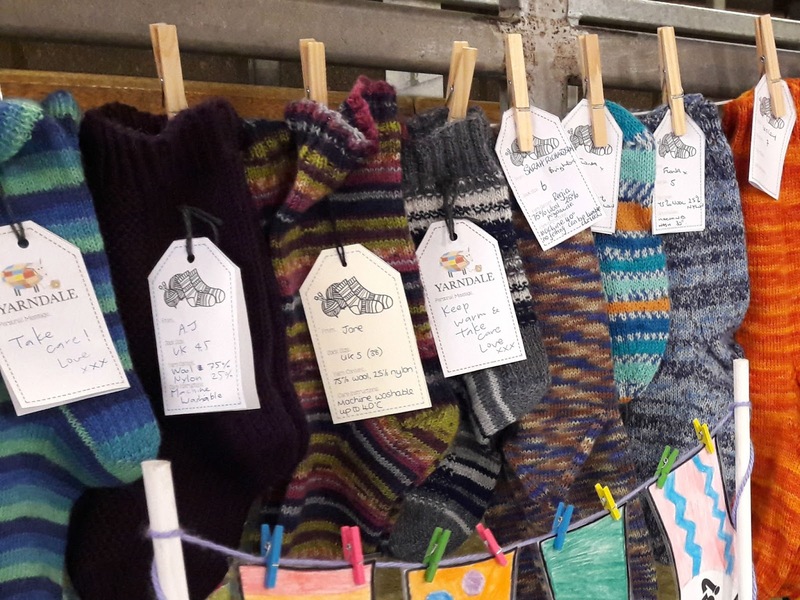 Every single one of these pairs of socks have been knitted with love for someone that the knitter will never know. I do go on about this a bit but I think it's important to keep saying it, because in our world where the media likes to focus on what's going wrong, we need to remember that some things are going right. I like to think that when I tell you that the pair of socks that you knitted has gone to, say, a homeless hostel or a children's hospice, you will smile, your heart will smile and that moment of connection will send love and positivity out into a world that needs all the love it can get. The socks kept coming, right over the summer. There was a bit of a production system going on! Another minion was roped in. I've had lots of offers of help this year (thank you to everyone who offered!) but it doesn't really take that long once we get going and I also think it's important for my girls to see such generosity first hand. 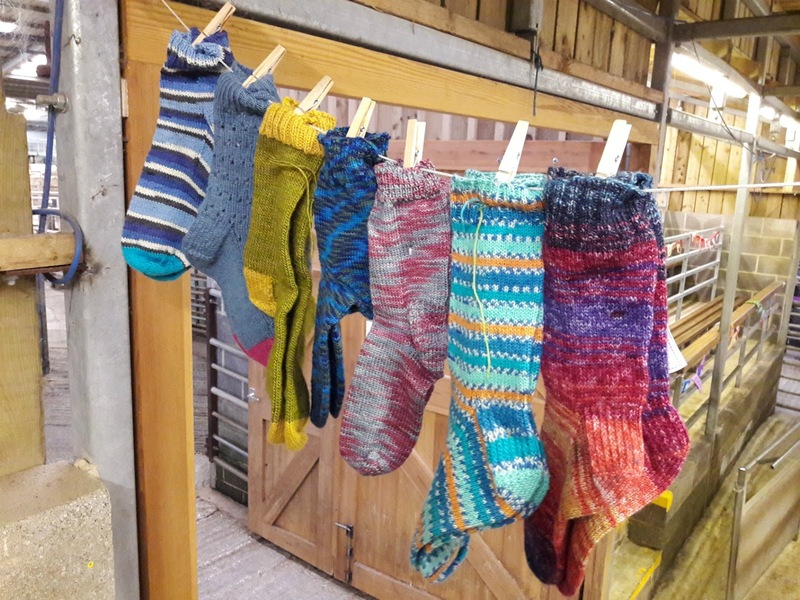 They've got so used to me knitting socks now that I don't think anyone in my family even notices (actually, I know that's true as I've knitted birthday socks for my husband right under his nose and he didn't notice)! Big daughter was particularly struck by the messages written on the backs of the tags. "That makes them really special," she said, and I agree. And still they kept coming! 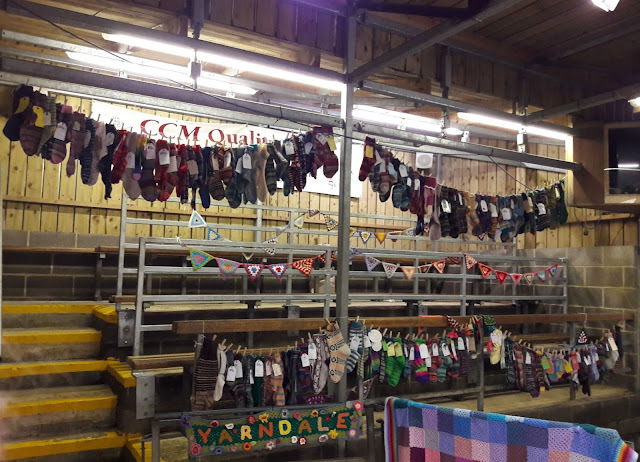 By the time I headed up to Skipton to help set up ready for Yarndale, we already had over 200 pairs to hang up. 200 pairs! We'd overtaken last year's total by 40 pairs of socks and Yarndale hadn't even started! Isn't that truly amazing? I was VERY glad that I'd bought more line to hang up and lots more pegs! It became quite obvious pretty early on that I was going to run out of space. For the last two years, the Sock Line has hung above one of the sets of seating in the Knit n Natter lounge, but I had filled that space and was only half way down one of the bags of socks! 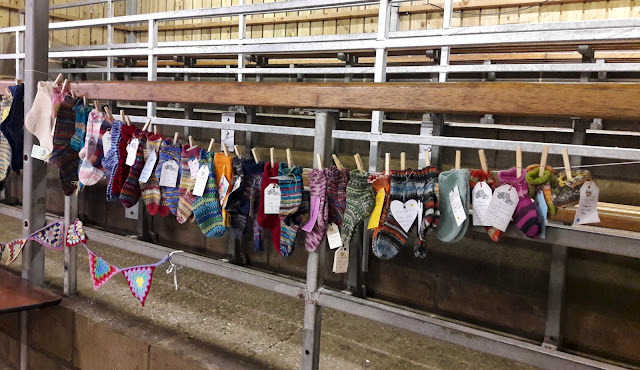 socks from all over the world, socks that came with their knitters to Yarndale and socks that have travelled thousands of miles to hang in the Auction Mart and be admired. And admired they certainly were. 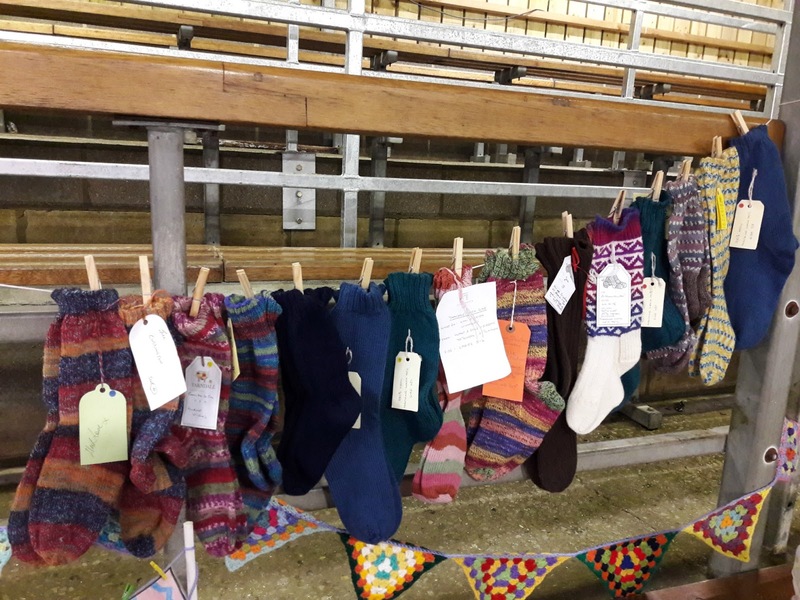 I don't think that anybody who came into the Knit n Natter Lounge could have failed to spot all of these fabulous pairs of socks, not even in the busiest Yarndale moments. I was asked on more than one occasion if they could be bought (to which I always replied "No, but can I teach you how to knit your own" :) ) but the joy of these socks is that they are a gift and more than that, a gift without obligation, which makes them very special indeed. At one point on the Saturday, I had so many pairs of socks that I ran out of space to hang them up. You can just see them piled up on the table on the right of this photo! Oh, and here are some of those messages that made big daughter catch her breath. They may only have taken moments to write but the effect that they will have will, I am sure, last a lifetime. I loved reading all of them and I know that whoever gets the socks will do too. 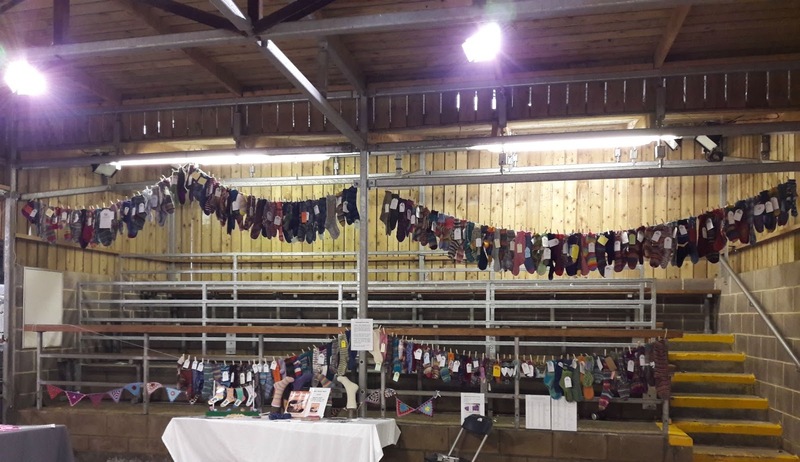 This is how part of the Sock Line looked on Saturday night. I managed to cram more pairs of socks onto the top lines so that there was more space on the bottom for new pairs of socks which I had been told were coming on the Sunday. 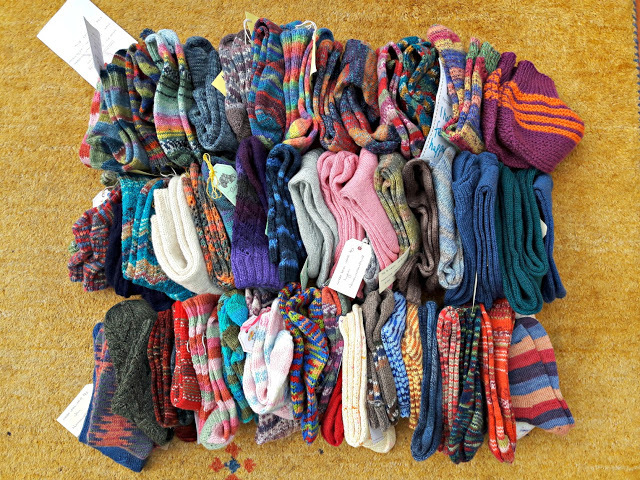 All of the socks on the bottom line here are ones that arrived over the Yarndale weekend (including the parcels that I opened) - and that's not all of them. Did you ever think that we'd have so many socks? I certainly didn't! 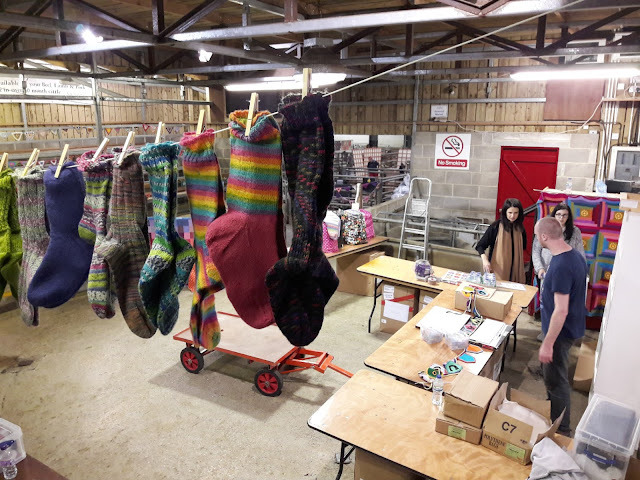 I'm nearly ready to start sending the socks out to their new homes, although don't worry if you've thought of somewhere that might appreciate them as there's still time to get in touch with me. 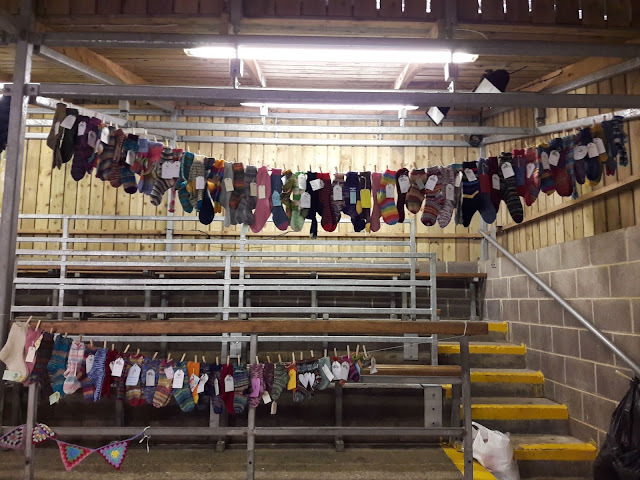 I'm looking for places where people can put the socks on their feet straight away so if you know of anywhere like that, do let me know through the comments or email me (the link is in the left hand side bar). 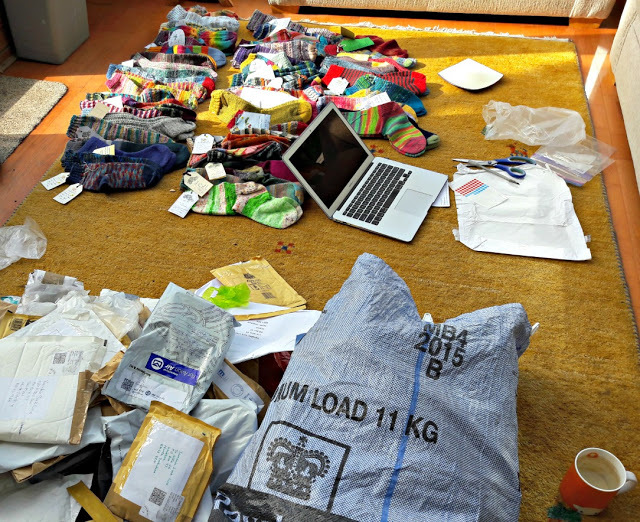 I'll definitely let you know where they all go (you can see where the previous years' socks went here) so you can see how many people we've been able to send socks to this year. Thank you so much to everyone who got involved, either for the first time or as a Sock Line veteran. Your generosity is amazing. See you next year! WOW WOW WOW!!!! that is amazing. That's great Christine, bigger number next year! That's really good. You are to be congratulated, Christine along with your helpers, for all your effort and work in sorting them out. 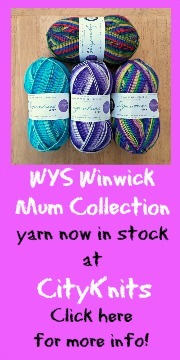 Knitting them seems the easy bit!! 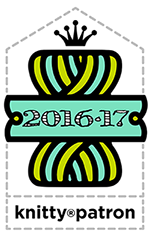 When do next year’s start arriving? Congratulations! That's amazing. So glad I got my act together this year! Oh Christine how amazing, 340 people are going to have warm toes and feel the love of this wonderful Sockalong community that you have created. It is quite remarkable that in just 32 short months you have taught and encouraged untold numbers to knit socks and other items; created two FB groups that have brought people from across the world together who are supportive and caring of each other; provided a space for new friendships to be formed and enabled the Sockalongers to share the love of sock knitting with those who are experiencing difficult times. 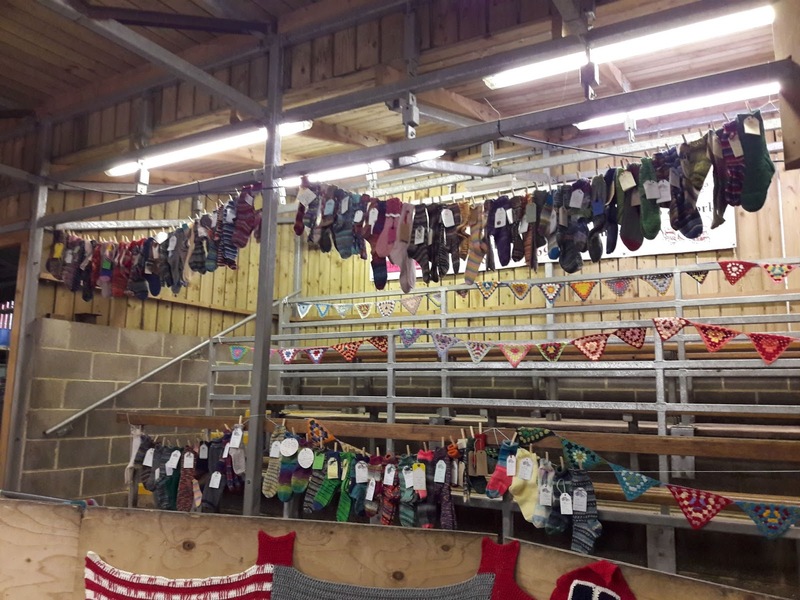 It is so exciting to see all those wonderful socks and gifts of love. 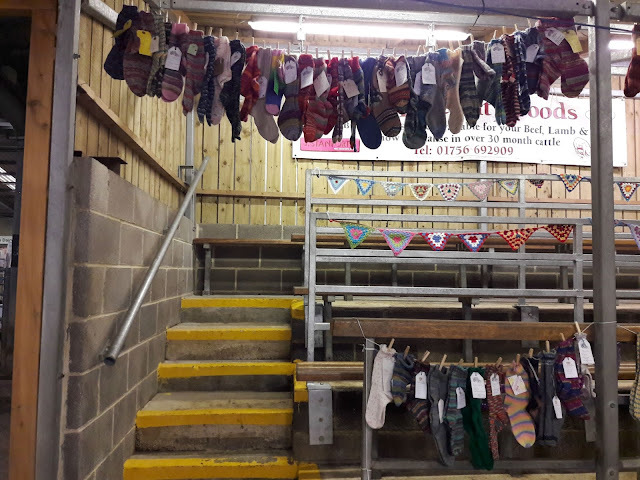 Thank you for creating this great community and all the work and organisation that must be involved in making the Sockline such a success. Crikey! 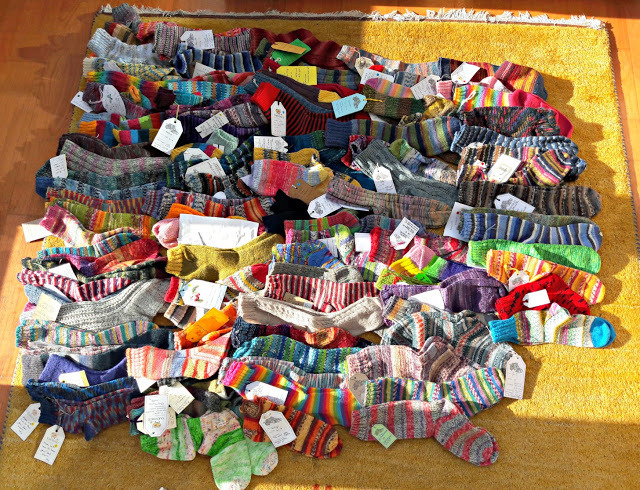 That's a lot of socks! It's quite a feat, the way you catalogue and organise them all. A-maz-ing! How wonderful! Well done everyone especially to Mum and her girls. How nice to have some good news. That is fantastic Christine - I feel really emotional reading this. Well done. 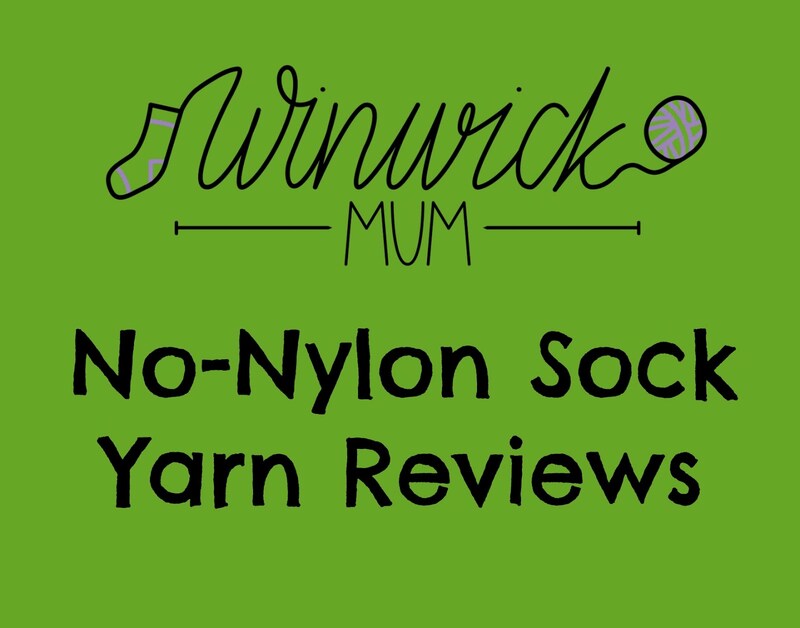 I'm just on to my second pair of socks from you're wonderful sock along - there'll be something for Sock Line for next year I think. Absolutely brilliant - it makes me feel very proud to be a small part of something so wonderful and generous!! Well done everyone!! And Christine for organising it all! That's fantastic news! Amazing! Such a wonderful idea. 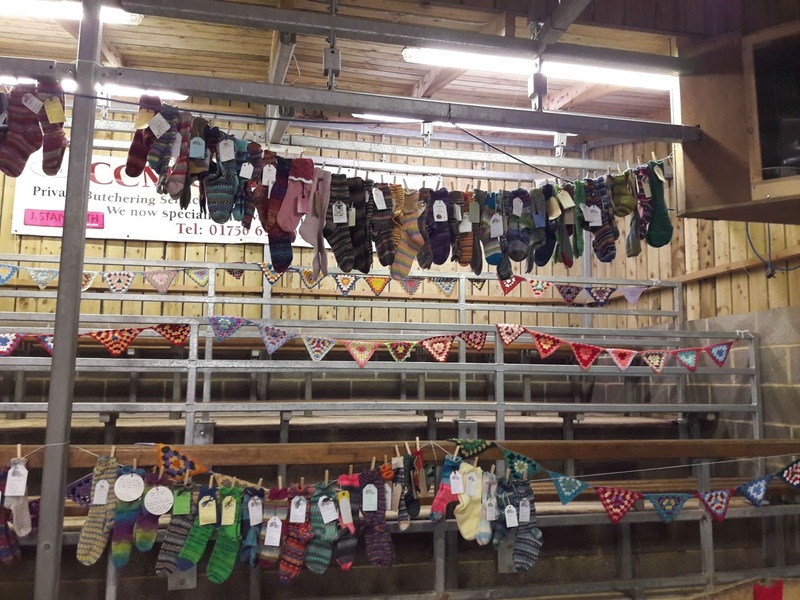 I was so impressed seeing all those beautiful socks at Yarndale. 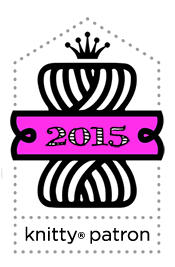 Hoping to join in next year! Thank you for sharing this. 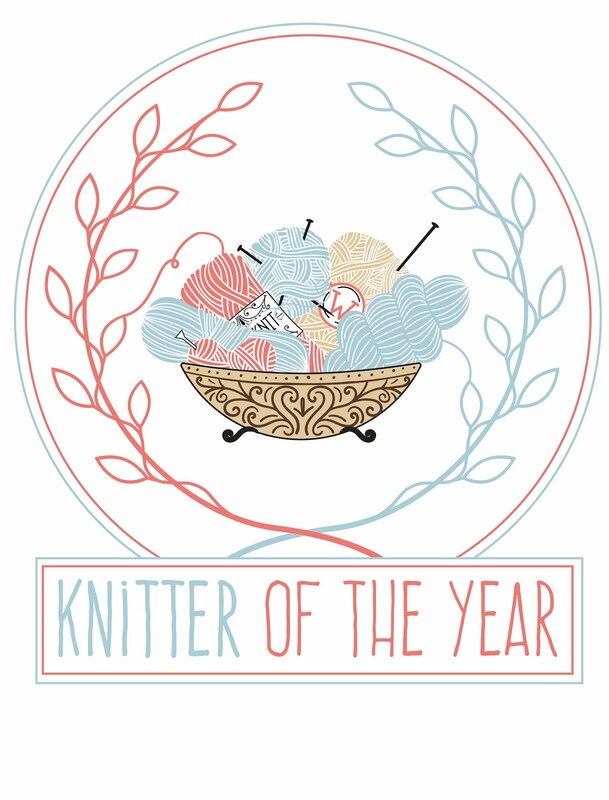 I am quite teary eyed, and only wish that I could knit faster so that I can participate. (It takes me a while; I haven't a lot of time - yet) I am hopeful for next year because you are right - there is so much noise about all the Awful in the world, yet this is something happening right under our noses. (literally) And it grows as we knit. And the seed was a small one; your desire to show people how to knit socks. You gave us and 340 others a great gift. Again, thank you. That is so impressive. Congratulations. 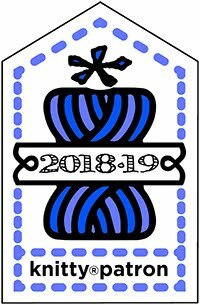 I am really glad to be starting out on my sock journey - hope I’ll be able to contribute next year. Like others have said, this was such an emotional post. I'm so pleased I was able to send in a couple of pairs and it makes my heart sing to think that someone out there will receive "my" socks and my love. You've started something wonderful Christine, that can only grow. Thank you. Wow! That's incredible! Well you inspired to start knitting. 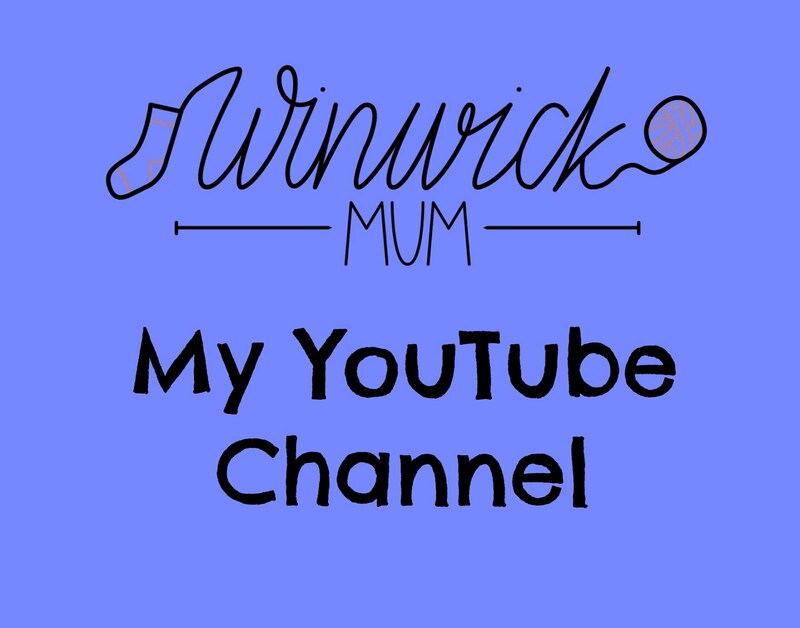 I've got my yarn and needles ready and your great tutorial! I've been crocheting blankets over at Attic 24! I live in Southern California and do use a blanket or two. But it's not cold like you're neck of the woods!? But I'm determined to start those socks. Just need to finish a blanket I started from Attic 24! Thanks for the inspiration!! Fantastic and I found my socks in a photograph. 500 pairs next year? That's pretty wonderful. 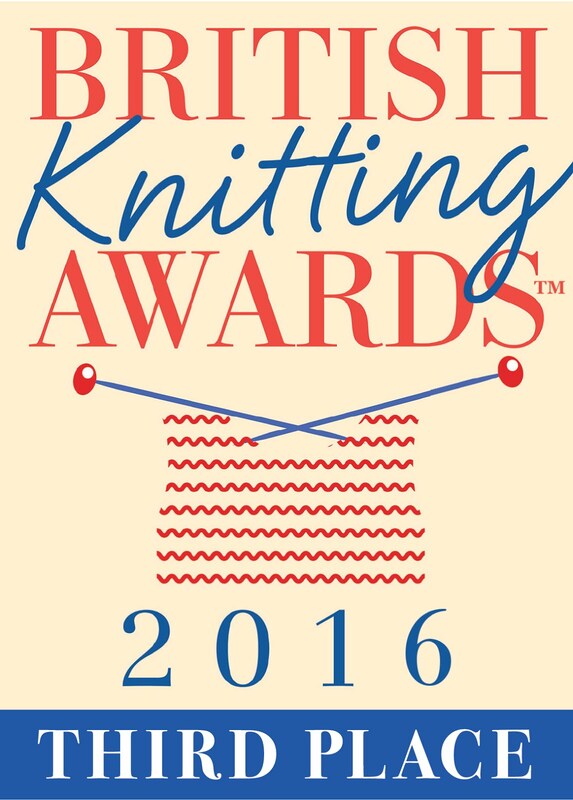 I learned to knit sock using your book and have knitted dozens of pairs since. So many people are wearing my socks now and I keep knitting them. My grandson says that he loves grandma's socks because they are so soft. Thank you, Christine for teaching me how to knit socks. It's a joy. Glad you received so many wonderful pairs for Yarndale. Wow that's amazing. Next year I'll get my act together and send you some. 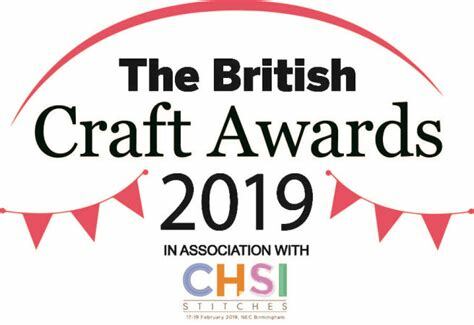 Well done Christine, a lot of hard work on your part to make this generous thing happen. I know this is likely not the place for this question, but I'm not sure where else to put it. 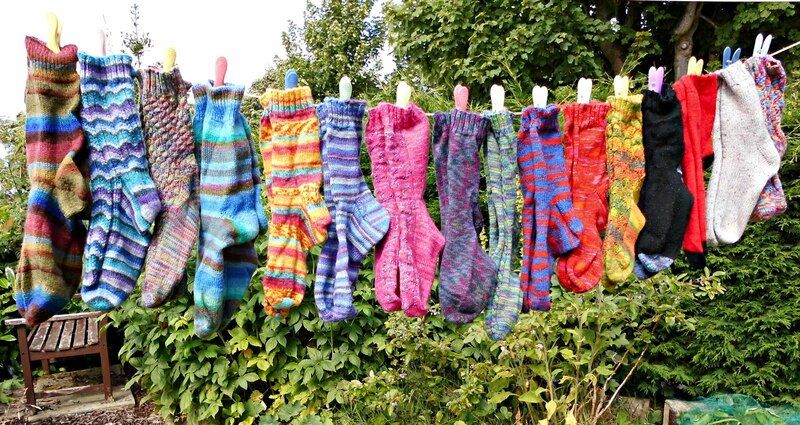 My question: In knitting socks, how do you weave in the ends invisibly? I'm sure I saw an explanation at one time, but have not been able to find it again. Do you show it on a video? Thank you for the quick reply. 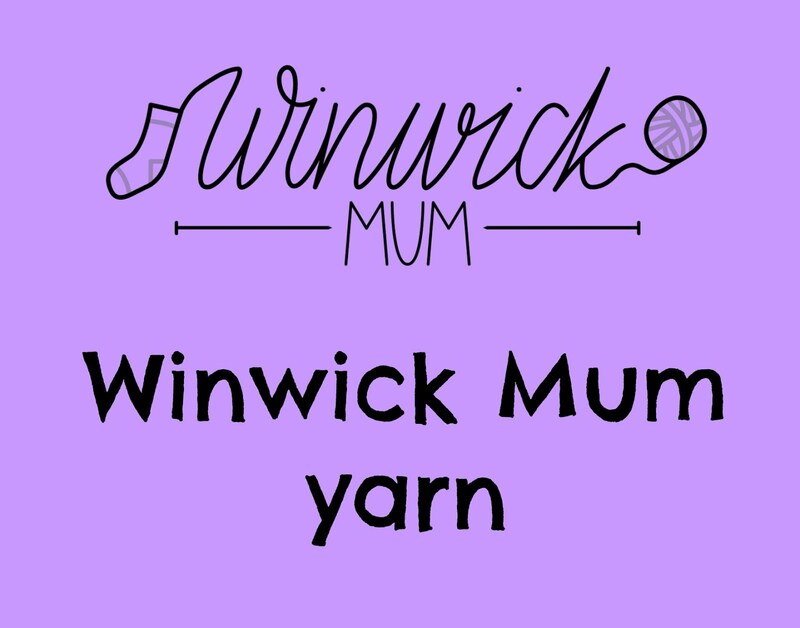 I've looked through the tutorial and while it is very comprehensive, what I was really wanting to know is how to weave in (invisibly) the long tails from the cast on and the kitchener stitch after you've completed knitting the sock. Does that make sense?